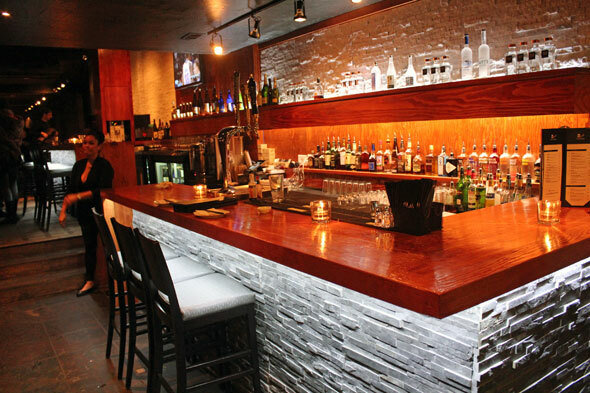 Hapa Izakaya opened its doors in September 2012 in Little Italy , as yet another Vancouver restaurant chain making a move for Toronto. With 10 years of Izakaya acclaim on the West Coast, it was time to see how both the edibles and the experience compared to some other 'sake shops' around town. The term "izakaya" is a compound word that comes from "i" (to stay) and "sakaya" (sake shop) - thanks, Wikipedia - so a spot of sake was surely a requisite starter. 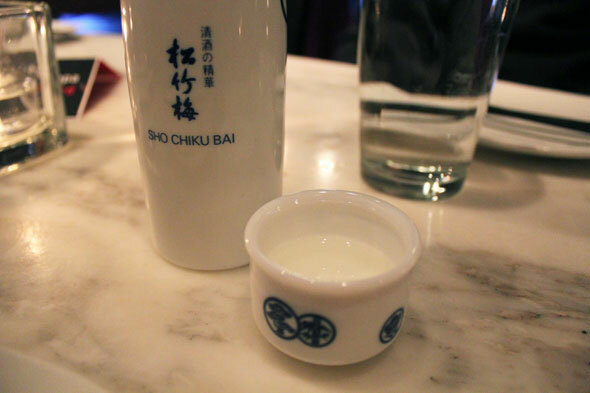 I was drinking mostly alone so I cheaped-out and went for the house sake - Sho Chiku Bai (available cold at $9/250ml, $18/500ml, and $27/750ml or hot for $13/300ml), which was still quite delicious. Several warm shots later, and my appetite was stirring. Aside from the standard menu offerings, Hapa is known for its more seasonal items and ever-changing daily dishes, and following a surprisingly short wait time, our meal came screaming out of the kitchen. When I say screaming I don't mean literally - as though the fine folks at Guu were serving me. 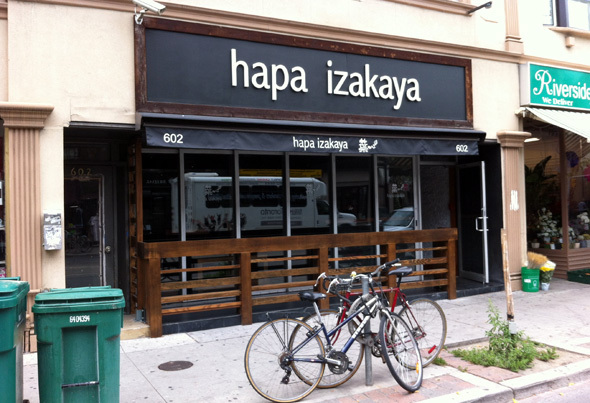 If you're looking for a bit more of a relaxed izakaya experience in Toronto, then Hapa just might be the spot for you. You'll still get the greetings and salutations upon entry and exit, but voices won't be hoarse by the end of the meal. 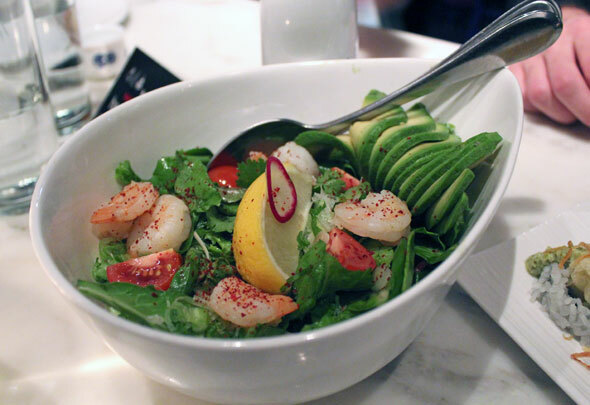 First up was an ebi avocado salad ($10.99). Not my first choice for a starter, but one friend requested some raw greenery. The prawns were tasty but small, the avocado ripe and still firm, but the citrus dressing could have packed more of a punch. Not a bad dish, but I'll be ordering my appetizer off another section of the menu next time. Thankfully (and not unexpectedly) it was all uphill from here. 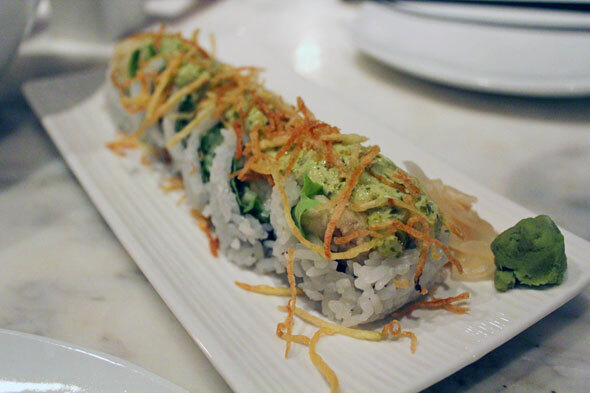 Our next selection came from the seasonal batch of sushi rolls. Relying on the appeal of the unconventional, the fish and chips roll ($9.99) was crispy, creamy, and delicious. Perfectly battered halibut tempura, light strands of shoestring potato frites on top, and a wasabi tartar sauce - this roll brought two very different types of cuisine together in a truly excellent way. Next up was a beef tataki ($9.99) - my last-minute pick - which saw lightly seared AAA beef shaved paper-thin and paired with sesame chili sauce, crunchy fried shallots, green onion and a zesty squeeze of lemon. The texture and flavour combos worked perfectly. Moving on. Only two of us at the table really like mackerel but both of us really, really like mackerel! 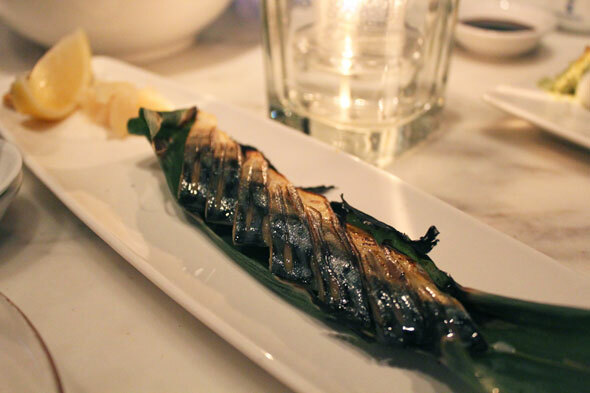 Blasted with a blowtorch table-side, the aburi saba ($8.99) was soft and sweetened from its marinade, smoky from the lick of the open flame, and contained a great balance of oil. We were initially attracted to the menu-standard of halibut tacos ($7.49) but were wisely swayed towards the teriyaki chicken tacos, avoiding overlap with the already ordered halibut roll. 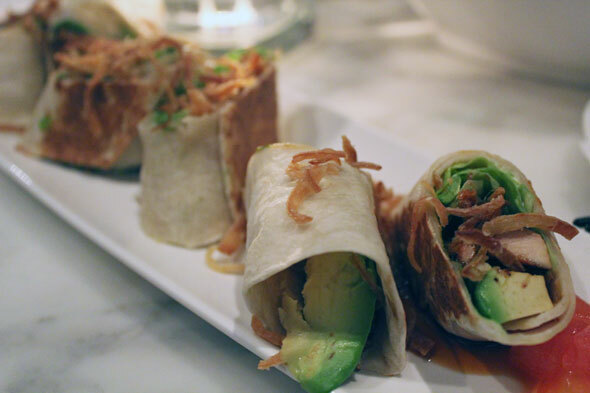 Juicy pieces of chicken breast, fried onions, avocado, and a lip-smacking teriyaki sauce, all wrapped up in a grilled tortilla - the dish was simple and well above average. No need to slow down just yet - our next dish was a mixed bowl of ishi-yaki ($10.99), which is rice with small morsels of well-marinated pork, garlic, sprouts, egg, tomato, lettuce, and a spicy miso paste. It was like a Japanese-ish bibimbap. No one was complaining about its authenticity or taste. A lot of people say that they save the best bites for last. Personally, I fall into that category. 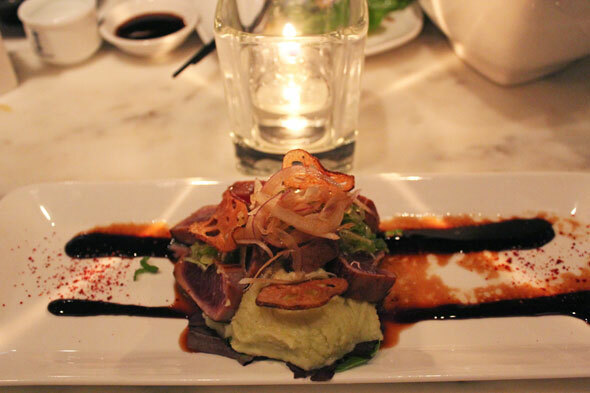 The ahi tuna steak is another one off the "Daily Features" menu, and if you're hitting up Hapa anytime soon, I suggest that this find its way to your table before it's too late! Pan-seared in a tangy red wine reduction, served on a bed of creamy wasabi mashed potatoes, and topped with the bite of green onion and sautĂŠed shallots, as well as crisp lotus root chips, this dish was dynamite (and pretty to look at, too). All warmed up from two bottles of sake, some great service, and a seriously tasty dinner - that was a wrap on the evening's affair. 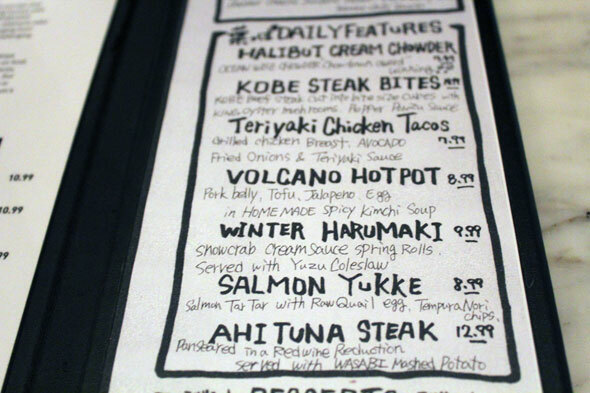 With much to sample still, and an evolution of sure-to-be-intriguing daily menu items, I've got a looming suspicion that, just like the influx of more of its Vancouver counterparts, this will not be the last I see of Hapa Izakaya.